Pergolas are really cool, in more ways than one. The word “pergola” is Italian but ultimately stems from the Latin for “to come or go forward” which is so appropriate given how inviting a pergola is in any home’s yard. 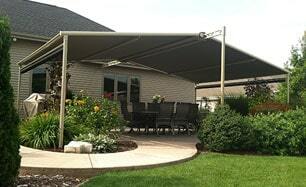 Patio Shades Retractable Awnings sells the world’s finest pergolas, custom built and shipped directly from the manufacturer, with sought-after name brands such as Pinnacle, Weather Master, American Classic and Gennius. Scan through our Pergolas and give us a call for superior service and total confidence that your pergola will arrive in mint condition, to your exact specifications for color and size. A pergola is an ideal space to beat the summer heat, grow your own veggies, entertain friends, enjoy a romantic moment or commune with the outdoors in solitude. Call today and you’ll soon see how much your family loves their pergola.